'On Life' was published by the Fee Age Press in England; a publishing house set up to side-step the censorship of Tolstoy in Russia, and to give him an international voice. So what is life? 'Life is the sum of functions which resist death,' says the scientist. But is it more than that, asks Tolstoy in 'On Life' - a philosophical and religious search for an understanding of life beyond scientific formulae. For Tolstoy, the basic contradiction for humanity is this: people aim solely for their own well being, but discover along the way that their own well being depends also on the well being of others. A further discovery by such people is that decay, old age and death attend their every step. Such basic human truths are the context for Tolstoy's search for happiness, in which Buddhist, Jewish, Stoic and Christian views are considered, as well as those of science. Tolstoy believes that fear of death is merely the consciousness of the unsolved contradiction of life; a sign of a carnal or animal mentality, which mistakenly takes part of life to be the whole. Tolstoy believes that individual well-being must be renounced and replaced by our 'reasonable consciousness', which points the way to true happiness, and brings human re-birth. CONTENTS INTRODUCTION. 1. The essential contradiction inherent in human life. 2. Humanity has recognized from the earliest days the contradiction of life. Wise men who have enlightened humanity, have given to the world definitions of life explaining this intrinsic contradiction, but the Pharisees and Scribes conceal it. 3. The errors of the Scribes. 4. The doctrine of the Scribes substitutes the visible manifestation of man's animal existence for the conception of the complete life of man, and draws from these manifestations deductions as to the aim of life. 5. The false doctrines of the Pharisees and Scribes no more explain the true meaning of life than they give guidance in it. Custom without any reasonable explanation is the sole guide of life. 6. The division in the consciousness of the men of our time. 7. The division of consciousness proceeds from the confusion of the animal life with the human. 8. The division and the contradiction are only apparent they are the consequence of false doctrine. 9. The birth of the true life in man. 10. Reason is the law recognized by man, in conformity with which his life must be perfected. 11. False direction of knowledge. 12. The cause of false knowledge is the false perspective in which objects appear. 13. The possibility of understanding objects increases not in proportion to their manifestation in time and space, but rather by reason of the unity of the law governing the objects we are studying, and ourselves. 14. The true human life is not that which is lived in time and space. 15. The renunciation of the well being of the animal individuality is the law of human life. 16. The animal individuality is the instrument of life. 17. Birth by the Spirit. 18. The demands of the reasonable consciousness. 19. Confirmation of the demands of the reasonable consciousness. 20. The demands of the individuality appear incompatible with those of the reasonable consciousness. 21. What is required is not renunciation of our individuality but the subjugation of individuality to the reasonable consciousness. 22. The feeling of love is the manifestation of the activity of the individuality subjected to the reasonable consciousness. 23. The manifestation of the feeling of love is impossible to men who do not understand the meaning of their life. 24. True love is a consequence of the renunciation of the welfare of the individuality. 25. Love is the sole and complete activity of the true life. 26. The efforts of men, directed to the impossible amelioration of their existence, deprive them of the possibility of living the one true life. 27. The fear of death is only the consciousness of the unsolved contradiction of life. 28. Carnal death destroys the body limited in space and the consciousness limited in time, but cannot destroy that which constitutes the foundation of life: the special relationship of each being to the world. 29. Men fear death because they have restricted life by their false conception, taking a part of life to be the whole. 30. Life is a relationship to the world. The movement of life is the establishment of new and loftier relationships; hence death is the introduction to a new relationship. 31. The life of men when they are dead does not cease in this world. 32. The dread of death proceeds from man's confusion of his different relationships to the world. 33. The visible life is a part of the infinite movement of life. 34. The incomprehensibility of the sufferings of earthly existence proves to man more convincingly than anything that his life is not that of the individuality which begins at birth and ends at death. 35. Physical sufferings constitute an indispensable condition of the life and welfare of men. CONCLUSION. Appendix I. Appendix II. Appendix III. Mr. H. W. Massingham on "Life. Russian author, a master of realistic fiction and one of the world's greatest novelists. Tolstoy is best known for his two longest works, War and Peace and Anna Karenina, which are commonly regarded as among the finest novels ever written. War and Peace in particular seems virtually to define this form for many readers and critics. Among Tolstoy's shorter works, The Death of Ivan Ilyich is usually classed among the best examples of the novella. 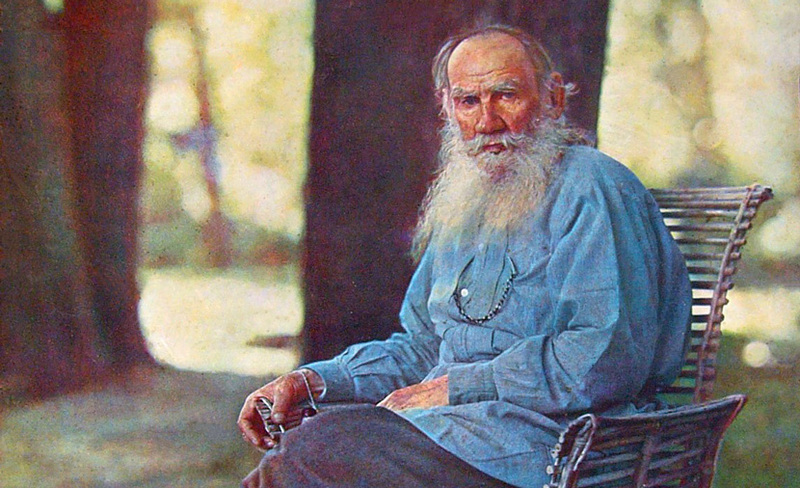 Especially during his last three decades Tolstoy also achieved world renown as a moral and religious teacher. His doctrine of nonresistance to evil had an important influence on Gandhi. Although Tolstoy's religious ideas no longer command the respect they once did, interest in his life and personality has, if anything, increased over the years. Those who visited Tolstoy as an old man also reported feelings of great discomfort when he appeared to understand their unspoken thoughts. It was commonplace to describe him as godlike in his powers and titanic in his struggles to escape the limitations of the human condition. Some viewed Tolstoy as the embodiment of nature and pure vitality, others saw him as the incarnation of the world's conscience, but for almost all who knew him or read his works, he was not just one of the greatest writers who ever lived but a living symbol of the search for life's meaning.